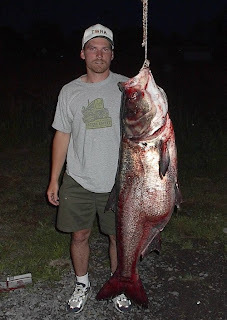 The Asian Carp has colonized the Mississippi River and devoured most of the other fish in that ecosystem. Boaters on the river are routinely whacked in the face by these fish when they leap out of the water as boats pass by. These fish can grow up to four feet long and weigh 100 pounds (photo credit: Tennessee Wildlife Resources Agency). The electric barriers in the Chicago Shipping and Sanitary Canal are in place and active, but there is still a risk that the carp could enter Lake Michigan if the Des Plaines River floods north of the electric gates. This could allow the carp to circumvent the barriers and gain access to Lake Michigan. In fact, it was a flood that allowed the carp to get into the Mississippi River. Carp are in the canal just 25 miles from Lake Michigan. If they get into the lake, it's game over for the other fish in the lakes.